Daimler's fourth-quarter operating profit fell 22% as trade wars and ballooning costs for developing electric and self-driving cars hit profits at Mercedes-Benz cars, the company said today. Daimler said the return on sales at Mercedes-Benz cars fell to 7.3% in the fourth quarter from 9.5% the same time a year earlier. For 2019, Mercedes-Benz Cars expects to achieve a return on sales of between 6-8% and a return on sales of between 5-7% for Mercedes Vans, Daimler said. "With our guidance for Mercedes-Benz Cars and Mercedes-Benz Vans we are below our long-term target margins. "We cannot be satisfied with this. 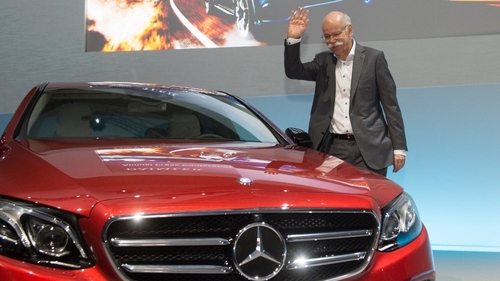 Our goal is to return to our target margin corridor of 8-10% by 2021," Daimler's chief executive Dieter Zetsche said in a statement. Daimler said its earnings before interest and tax (EBIT) dropped to €2.67 billion in the fourth quarter, below analysts' expectations of €2.92 billion. Mercedes-Benz passenger car sales rose 4% in the fourth quarter but increased tariffs on vehicles exported from the US to China and delivery stoppages for individual diesel models hit demand and resulted in weaker prices. Mercedes-Benz emerged as the biggest selling luxury brand last year with 2.31 million new vehicle registrations, followed by BMW brand's 2.12 million and Audi which posted registrations of 1.81 million last year.